Commemorate the establishment of the West Bench as a Veterans' Land Act project. In this sense, it is Part B of the Selby Park tribute. Mark the starting point of the walking path. Better establish the idea of the West Bench (broadly defined to include Sage Mesa, Husula Highlands, etc.) as a place distinct from Penticton. All this is still very preliminary and the purpose of this post is to solicit feedback from people with strong feeling one way or the other about such a sign. As I envision it, the sign would be paid for using "gas tax" funds (see note 2). The West Bench VLA project got off the ground in 1953. The mid-century concrete and steel look is meant to reference this point in history. It also references the Selby Park sign. 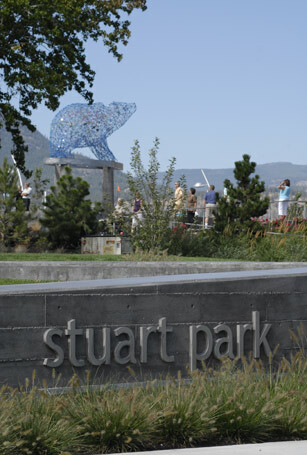 The new Stuart Park sign in Kelowna also has this look. The start of the walking path is not obvious so the idea is to use the sign as a bit of a marker at the bottom of the hill. In this sense it is part of the walking path. 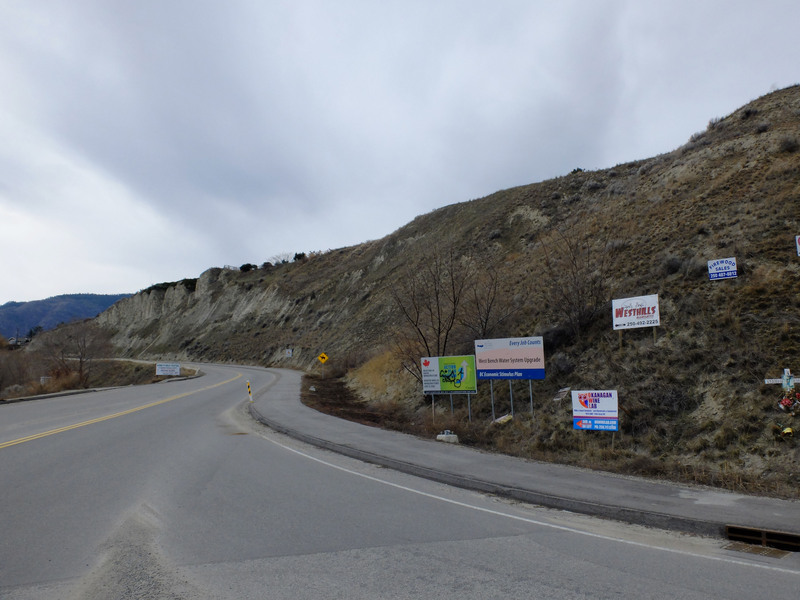 The orientation is intended to make the sign visible to people traveling to Kelowna. It is an answer to the question: "Where does that road go?" It is, of course, also visible to people who use the West Bench Hill Road. Please let me know if you have any questions or concerns about this project. At this point it is still conceptual, although the Area F Parks Commission has voiced its approval in principle. A brief update on the lighting of the path can be found here. The sign and the lights are linked in my mind. 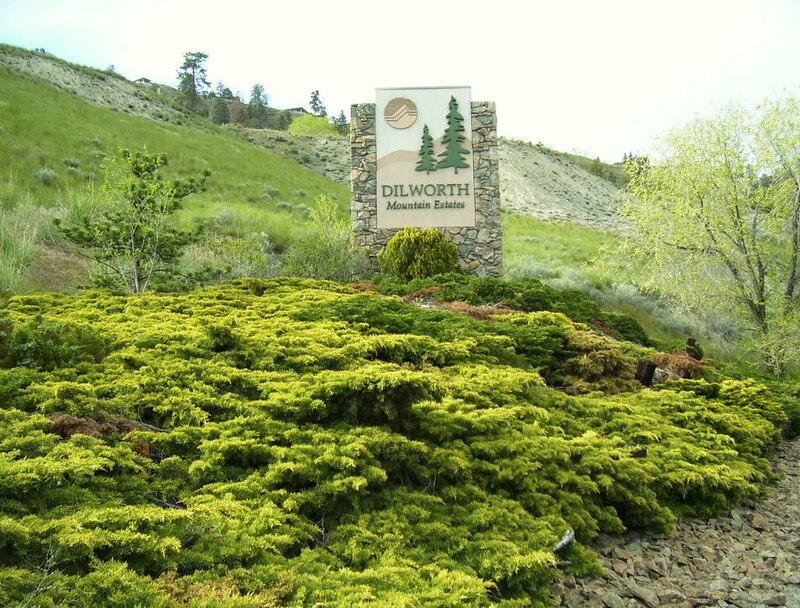 Of course the Dilworth Mountain sign is a completely different style. The lettering and the landscaping evokes a different time and place (mid-1980s in my mind). You may have noticed that construction has commenced. As for the lighting question below (in the comments) we anticipate something like the following (only quite a bit smaller). Also, we will not have irrigation tubing all over the place. Note 1: This project would also give the RDOS an excuse to remove the cluster of signs that blight the entrance to the West Bench. These signs are on Ministry of Transportation and Infrastructure right-of-way. Although MoTI agreed several years ago to remove all unauthorized signs on MoTI right-of-ways, their resolve to do so has clearly wavered. If you feel strongly about these signs you should contact your MLA. Note 2: Gas tax revenue is made available to all electoral areas in British Columbia for certain types of cultural or recreational projects. Although it is technically grant money, the scope of the gas tax program is so broad that it is more accurate to think of gas tax funds as cash. It is not cash raised directly from your property taxes, but it is cash nonetheless. Just so we are clear. Gas tax money could be used for other things. I love the idea. Perhaps in conjunction with the street light project, we could plan for low voltage lighting. 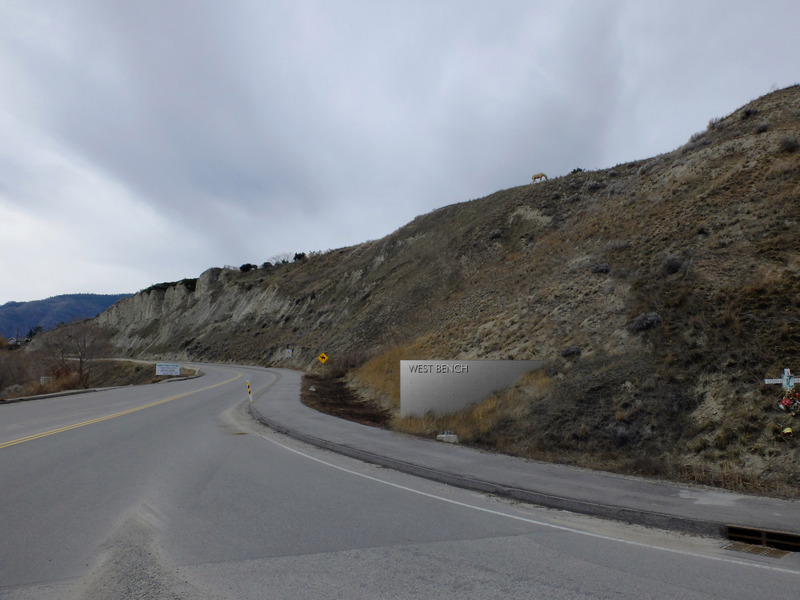 It would make the sign stand out at night and would welcome residence and visitors to the area.